This piece appeared in The Big Issue in October 2014. When it comes to housing there are no cheap parts of London. Some places are slightly less extortionate than others. Stratford, in the east London borough of Newham, used to be one of those slightly less than extortionate places. Not any more. A quick glance at the Foxtons website shows the average rental value of flats in Stratford to be £424 a week. The Carpenters Estate – a group of late 1960s tower blocks and low-rise council flats found in the shadow of the Olympic Stadium and Westfield shopping centre – now sits in the way of Stratford’s commercial development potential. The estate awaits demolition. Most residents have been “decanted” by the council: bought out or relocated. Yet one group of young mums saw the boarded-up windows and decided to ignore the council’s plans for the future. 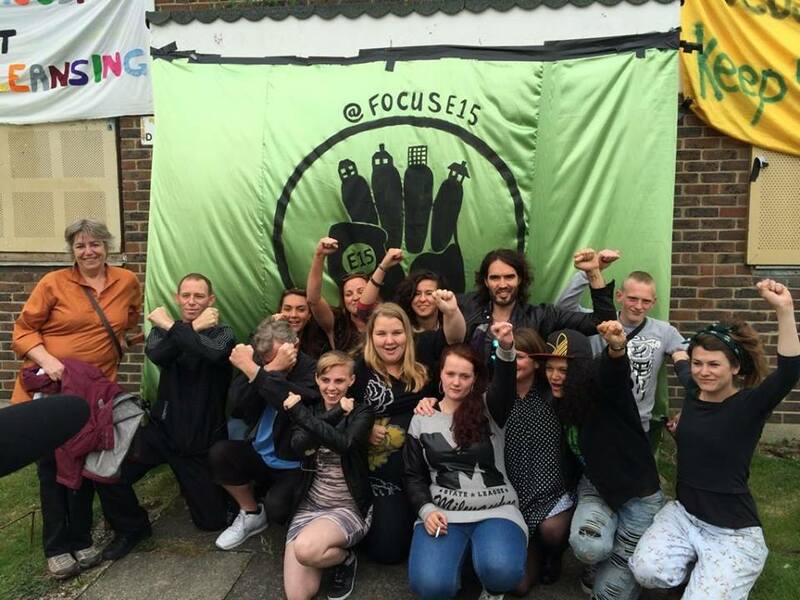 They had been living in a purpose-built hostel for young people in Stratford – Focus E15 – but were given eviction notices in August 2013 and told they might need to move hundreds of miles away for social housing (the Focus E15 building has since been turned into luxury flats). One of the young mothers, Jasmin Stone, 20, was born and raised in Newham. Her daughter was 13 months old when she was told to leave supported accommodation. “I’ve always lived in the area, so to find yourself in need of a house and for the council to say to me, ‘You’ll have to go to Manchester, Hastings or Birmingham’, it was shocking. “Every time we spoke to them, they said there were no more houses in the area,” she adds. “So when someone pointed out the number of houses sitting empty round here, we couldn’t believe it. The small, low-rise brick block the group occupies now resembles a radical squat. Activists more accustomed to this sort of thing have joined the cause. Solidarity with Cuba notices are pinned to the walls. A talk by a representative of Lesbian and Gays Support the Miners is down on the rota. And comedian Russell Brand has just been on the phone to help arrange a press conference on the steps of Bow County Court (the campaigners avoided eviction at court but eventually agreed to leave by October 7). A protest that two or three years ago might have been dismissed as the work of troublemakers has captured the imagination. Many Londoners are seriously fed up. In a recent YouGov survey 56 per cent said housing costs made it hard to get by in the capital, and 41 per cent said they are thinking about upping sticks and leaving London. The only portion of the population who said they were managing fine with housing costs were those earning over £70,000. It is the poorest who have already been priced out of central London, without too much say in the matter. A slew of depressing, well-documented trends are conspiring to change the fundamental geography of the city. Post-war council estates are cleared and demolished – glassy, boxy, high-density flats marketed as “luxury” spring up in their wake. A small proportion of flats set aside as “affordable” go for 80 per cent of market rents, way out of whack with average incomes and living costs. Housing associations now act as part-time property developers, bidding to build for young professionals willing to pay market rates (in the hope it might help subsidise their prime duty of providing social housing). The bedroom tax and benefits cap are also pushing more people on the lowest incomes to give up tenancies and accept something less desirable in the outer boroughs or other parts of the country. And all the while central London continues to pulse, attract and absorb people desperate for all the opportunities the city promises. The desirability of once rundown areas including Brixton, Hackney and Peckham is reversing the near century-old flight of the middle-classes into the suburbs to start families. The Economist calls this turning-inside-out of London “the great inversion”. The huge estate agent Savills has produced a fascinating map (pictured below) of London that shows how “red” inner boroughs have moved upmarket in socio-economic status since 2001, while formerly leafy suburbs including Ealing and Harrow are turning down-market “blue”. “Whether you love or hate gentrification, it’s real and it’s happening,” says Neil Hudson, one of Savills’ research directors. “It’s a growing London, both in population and in terms of the wealthy population looking to live as close as they can to job hotspots. If the great inversion continues, London could soon come to resemble Paris. In the French capital the poorest live out in the banlieues – troubled periphery estates where youth unemployment is typically more than 40 per cent. Danny Dorling, a leading professor of human geography at Oxford University, wonders where relentless market forces will lead us. “Wherever there are quite a lot of rich people there tends to be poor people quite near to service them,” he says. “You need to get them from somewhere. I suppose it could be Basildon [in Essex] instead of London, if there are enough cheaper early morning trains to get these poorly paid people in. That’s what we’re heading towards. There must come a point when you can’t get a young professional couple to pay a certain ridiculous price to live in the middle of London“But there must come a point when you can’t get a young professional couple to pay a certain ridiculous price to live in the middle of London. Those [gentrified] areas are getting younger as the average age of a Londoner falls. I think you’re looking at increased naÏvety. When I visit Glyn Robbins, a housing campaigner working on Quaker Court, a rapidly changing council estate in Islington, he shakes his head while explaining how tiny one-bedroom flats are being rented out privately for £300 a week (the ongoing impact of the Right to Buy policy). “With remaining council tenants, the narrative is now, ‘How dare these people live here, in the middle of London on a discount?’ There is almost a special citizen status to the council tenant in central London,” says Robbins.